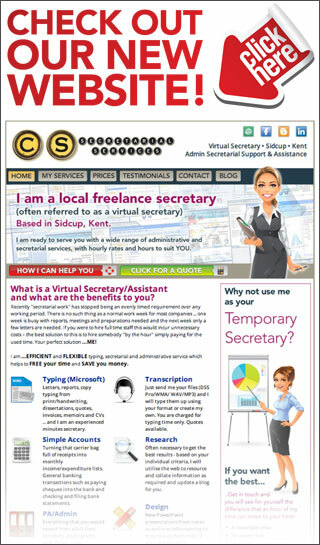 I am a local freelance secretary (often referred to as a virtual secretary) based in Sidcup, Kent. I am ready to serve you with a wide range of administrative and secretarial services – tailor made to suit your request. • Behind with your office work? • Not looked at your post for weeks? • Need some one-off typing or small project? • No time to make those all important phone calls? look no further than Me! I work from home in a fully equipped home-office, with the ability to transmit documents by email ensuring minimum financial and time costs to you. Should you require work to be performed within your own premises, this can be easily arranged. No job is too large or too small. I specialise in a complete range of small business and personal administrative services – from letter writing to dissertations. Hourly rates available. Recently “secretarial work” has stopped being an evenly timed requirement over any working period. There is no such thing as a normal work week for most companies ... one week is busy with reports, meetings and preparations needed and the next week only a few letters are needed. If you were to hire staff this would incur unnecessary costs – the best solution to this is to hire somebody “by the hour” simply paying for the used time. Your perfect solution ... ME!